Recent traveller through Port Moresby’s Jacksons International Airport says some of this strategy seems to be working. 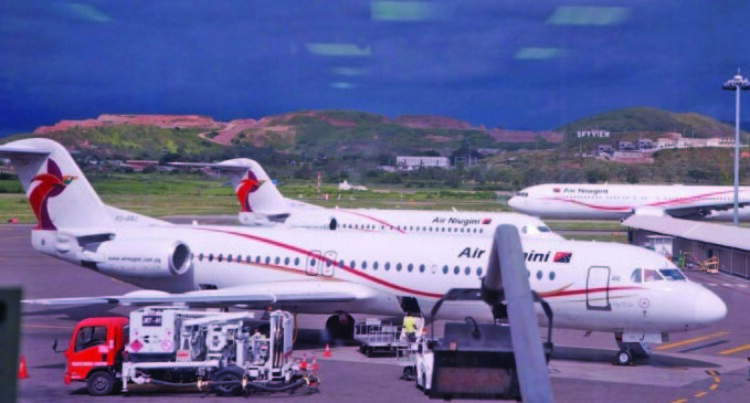 Traveller reports Fiji, Vanuatu and Solomon Islands passengers on Air Niugini incoming flights connecting at Jacksons with Air Niugini outgoing flights on to Asia. Traveller says an Air Niugini Fokker 100 flight he was on from Honiara to Jacksons was full, and most of the passengers were in transit to Asia. Air Niugini operates through Port Moresby from Jacksons to Hong Kong, Japan, Philippines and Singapore. It still harbours ambitions to add China to its destinations despite an aborted launch last year. It appears to be increasingly trying to compete with Fiji Airways going into Asia. Same traveller reports service at Jacksons is much improved since last there. With a lot of smiling and genuinely helpful people. Perhaps a result of Mr O’Neil’s emphasis last year on Port Moresby hosting the big APEC summit. Matson South Pacific has recently launched a new service to the Christmas Island, or Kiritimati as it is known in Kiribati. Matson will service Christmas Island every two months from Fiji. Its local shipping agent is Williams & Gosling Limited. Kiritimati is the largest land mass in Kiribati. it has a growing tourism industry with game fishing and ecotourism. It exports copra, fish and seaweed. Fiji Airways operates some flights into Kiritimati on its Nadi-Honolulu-Nadi service. The owners of Coffee Bean, have opened a second coffee shop at Fiji Broadcasting Corporation House where the old Gloria Jeans outfit used to be. Last year FBC had put out a tender for the space at its building and Romita Singh the owner of Coffee Bean won the tender. They have kept some of the staff that were previously employed by Gloria Jeans at that outfit. This cafe offers more varieties of pastries, sandwiches, a full day breakfast menu and a blackboard menu. Kudos to Ms Singh, a former school teacher, for offering a new spice in the heart of Suva. Her first Coffee Bean outlet is located at the Charan Jeath Singh Nabua Complex.